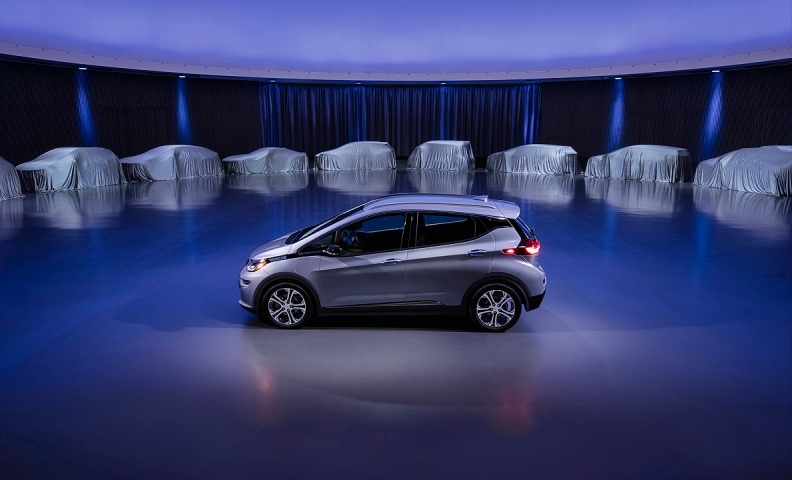 The first two new vehicles will be based off learnings from the Chevrolet Bolt EV (pictured). DETROIT -- General Motors said it plans to launch a mix of at least 20 new all-electric and hydrogen fuel cell vehicles globally by 2023, including two in the next 18 months. The all-electric and fuel cell vehicles represent a "two-pronged" approach to the automaker's vision of an autonomous, zero-emission future that was recently announced by GM CEO Mary Barra. At least the first two new vehicles will be based off the current Chevrolet Bolt EV architecture, while future ones will feature an "all-new battery system" and architecture that GM briefly previewed Monday at its Technical Center in Warren, Mich., near Detroit. GM declined to provide specific details about the next-generation propulsion system or what vehicles will become electrified. The new vehicles announced Monday were built "from the ground up," according to Pam Fletcher, GM executive chief engineer of autonomous & electrified vehicles and new technology. "This is just a taste of what's to come over the next months and years," she said. "The story is more than just what you can see; it's also about what's under the skin." GM’s electrified “future will be profitable,” according to Mark Reuss, GM executive vice president of global product development, purchasing and supply chain. He did not elaborate on a time frame for that profitability or when the automaker could exclusively offer zero emissions vehicles. On Wall Street, GM shares gained 4.4 percent to close at $42.15 -- GM's all-time high closing price since the reorganized company started trading its stock in November 2010. Three clay models of vehicles designed for the next-generation propulsion system that were previewed Monday included a Buick crossover, Cadillac wagon and a pod-looking vehicle with "Bolt EV" badging. They were designed for the next-generation EV architecture, which includes two different heights of cells for the battery pack. "These three vehicles demonstrate why that height difference is important," Reuss said. "You can do different H-points, you can do different roof lines and you can do different range capabilities and different performance." Another six vehicles were kept under sheets at the automaker's Design Dome in Warren. All -- except one that appeared to have the silhouette of a Chevrolet Corvette -- looked to be crossovers or SUVs. Fletcher said GM is planning to introduce the new vehicles in key, hot-selling segments such as crossovers and SUVs. GM’s Brownstown Battery Assembly plant south of Detroit is to begin producing a fuel cell system through a previously announced joint venture with Honda Motor Co. in 2020. The automaker also introduced SURUS (Silent Utility Rover Universal Superstructure), a fuel cell powered, four-wheel concept based on a heavy-duty truck frame that's driven by two electric motors. It features autonomous capabilities, according to the automaker. Charles Freese, GM executive director of global fuel cell business, said SURUS is designed for a “wide range of applications,” including freight and emergency rescue vehicles such as ambulances and military vehicles for disaster relief efforts. The platform is powered by GM’s newest fuel cell system. It features instantaneous high-torque, exportable power and can even produce its own water, according to Freese. Meanwhile, Ford CEO Jim Hackett is expected to offer at some initial solutions for Ford's plans for autonomous vehicles and electrification when he briefs analysts and investors Tuesday in New York. Ford said earlier Monday it expects to go beyond the 13 EVs it has already planned for the next five years.